What does an elevator mechanic do? Would you make a good elevator mechanic? Take our career test to find out how you match with this and over 800 other careers. What is an Elevator Mechanic? What is the workplace of an Elevator Mechanic like? An elevator mechanic is someone who is trained to install, assemble, maintain, replace and repair elevators, escalators, chairlifts, dumbwaiters, moving walkways, and other similar equipment. 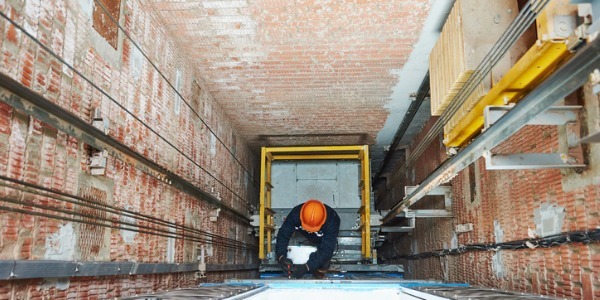 There are several areas to specialize in as an elevator mechanic. 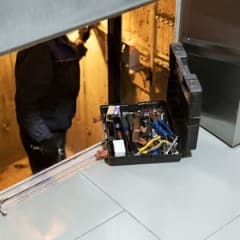 There are maintenance elevator mechanics who have a specific route, and they will service the elevators on that route. There are elevator mechanics who do service work – the bigger and heavier work that requires two men to do. And there are elevator mechanics that modernize elevators or who build brand-new elevators in new buildings. installation of elevators, escalators, chairlifts, moving walkways, dumbwaiters etc. Elevator mechanics regularly test equipment to make sure it runs efficiently. They also take care of electrical problems by using diagnostic instruments, such as voltmeters and ammeters. They are responsible for making sure that elevator machinery conforms to building safety codes and equipment safety regulations. Using a variety of equipment and tools, elevator mechanics often have to replace cables, machine bearings, and elevator doors. Some elevator mechanics work on cabled elevators, or on elevators where the car sits on a pump driven hydraulic plunger. Some perform maintenance and repairs to escalators, fixing the motors and electrical wiring. Are you suited to be an elevator mechanic? Elevator mechanics have distinct personalities. They tend to be realistic individuals, which means they’re independent, stable, persistent, genuine, practical, and thrifty. They like tasks that are tactile, physical, athletic, or mechanical. Some of them are also investigative, meaning they’re intellectual, introspective, and inquisitive. Does this sound like you? Take our free career test to find out if becoming an elevator mechanic is right for you. Elevator mechanics are employed by elevator manufacturers, and elevator installation and maintenance companies. They may work on a team or alone; an installation or major repair would require working on a team while one would work alone when troubleshooting a small problem. The standard work week for elevator mechanics is 40 hours, and there are peak periods that will require some overtime. If one is working in maintenance or repair, they may be asked to be on 24-hour call for set periods of time. The work is typically indoors and with a team of other construction professionals. Most elevator mechanics work in the city where multi-story buildings are common.